The scope comes loaded with all sorts of capabilities as I defined the build. First for the optic, a Lightholder Optics 16” F/4.0 mirror was chosen, and this is a fantastic mirror visually stunning views, and equally impressive specs. The F/4.0 keeps the eyepiece at eye level for me while at zenith. There’s nothing like seated or flat footed observing for those long nights. The secondary mirror is from Antares Optics (1/20 wave), and the mounting includes a lighter duty dew heater solution to help prevent dew. It does a great job in normal dew conditions, but doesn’t keep up in heavy dew conditions (this was known in advance), and an available custom dew solution would be required to meet those rarer cases of heavy dew. The aluminum bearings are not only aesthetic, but they are powder coated with a bit of an “orange peel” texture to them. This adds a tiny bit of resistance to the rotation, and reduces the amount of counter weight adjustments from heavy to light eye pieces. Speaking of which the counter weight for the scope is under the mirror box, keeping it out of the way. With a single setting of the counter weight, I’m able to have either no eyepiece in the scope or a Televue Nagler 31mm (very heavy eyepiece) in the scope. This is GREAT for changing eye pieces without losing the target due to balance issues. I have not adjusted my counter weight in over 2 years. Some users may think this bearing approach feels too sticky at first, but I have been able to evolve my touch so that I can adjust to a fine degree of accuracy. Both Alt and Az axis of movement glide in a very smooth fashion, and are easy to target in longer, shorter and precise pushes. I was glad to see that the focuser used is a duel speed Moonlite focuser, as I’m loyal to that brand of focuser. There are four secondary mirror collimation push/pull screws, and three push/pull knobs on the 18-point mirror cell assembly and this makes collimation super easy, stable and reliable. The tri-boundary layer fans cool the scope rapidly and efficiently. The fans are quiet and operate with very low vibration. I’ve often started observing with them running and did not notice. Other standard features included with the scope are a Telrad finder as well as wheel barrow handles for moving the scope if needed. However, I will state I only use the wheel barrow handles in my garage to move the scope in and out quickly. 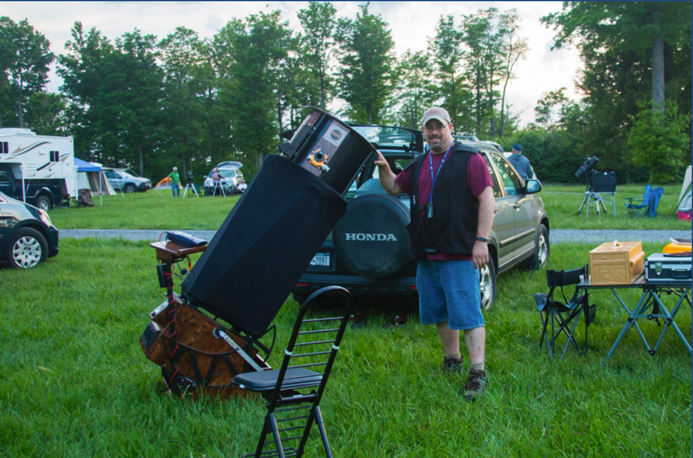 When on the road, I can carry the scope components to the spot on the observing field. 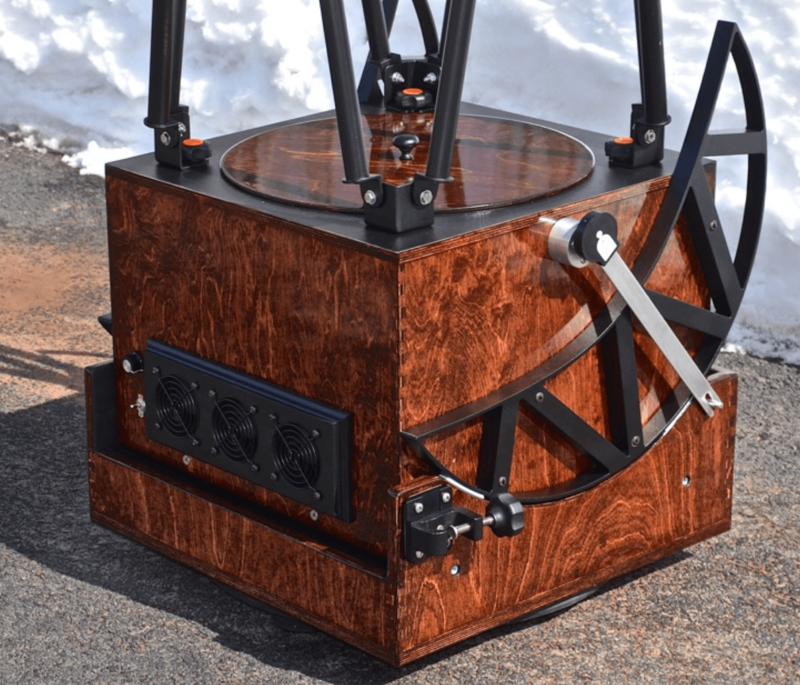 In my scope build I ordered the Argo Navis and Push-To Encoder solution offered through New Moon Telescopes. This is a very easy to use system. The encoders are placed on the scope, and each encoder has cables which are run to the Argo Navis computer. This encoder solution works very well. Also as part of the custom build, Ryan built a tablet stalk that I mounted the Argo Navis too as well as for holding my iPad that I use for reference. This solution worked great for me, and 6 months ago I replaced the Argo Navis with a newer Nexus DSC solution which is well supported by the encoders on the scope. Of the biggest items of importance to me is easy setup. I don’t know how many times I’ve seen folks in the observing field looking up what poles go where, messing up their pole placement, taking it apart, etc…etc. I wanted simple and fast. New Moon Telescopes comes with an amazing 1 piece truss tube assembly that is super simple to use. Open the tube assembly, place it on top of the mirror box, tighten the four screw down connectors, place the cage on top of the assembly, and tighten down those four screw connectors. That’s it – very simple. I love this feature! To move the scope pieces from my car to where I’m going to observe and complete setup all the way through collimation, it takes me about 8 minutes by myself. If I’m using the Push-To Electronics, then that might be 10 minutes. No ladders, no math, no odd and frustrating hardware pieces, no secret tricks – just a simple setup and start observing. This is a wonderful innovation. 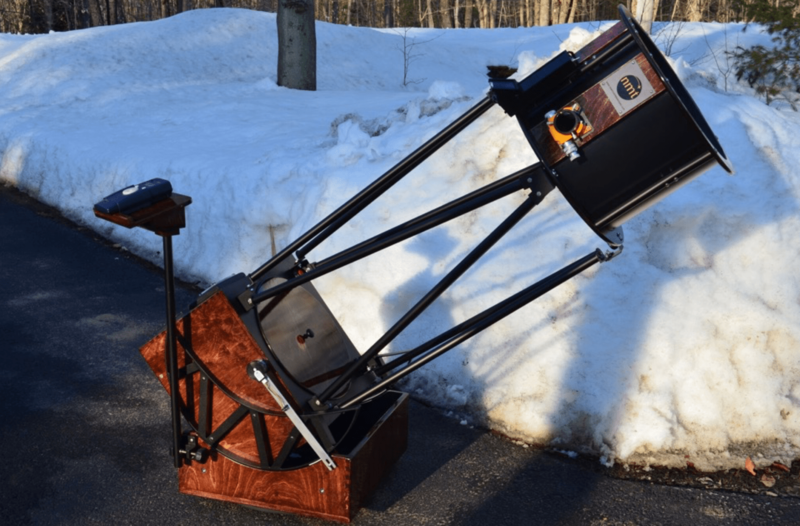 A dobsonian telescope is a simple endeavor, and one of its goals is to minimize the amount of maintenance required. I clean the mirror 1-2 times a year, and I will admit that the first mirror cleaning was a bit of an adventure for me. Ryan was there for me though, and he walked me through step by step removing the mirror from the telescope and how to reinstall it. Like many things in life, it’s easy after the first time. The only other regular maintenance on the scope is every other year or so a screw loosens up on the truss tube assembly, and a simple screw driver can be used to tighten it up. After purchasing my New Moon Telescopes 16” Dob, the amount of observing hours I logged doubled easily. The scope performance is superb, but making it easy to setup, roll out, collimate, etc really makes the big difference in my very busy life. 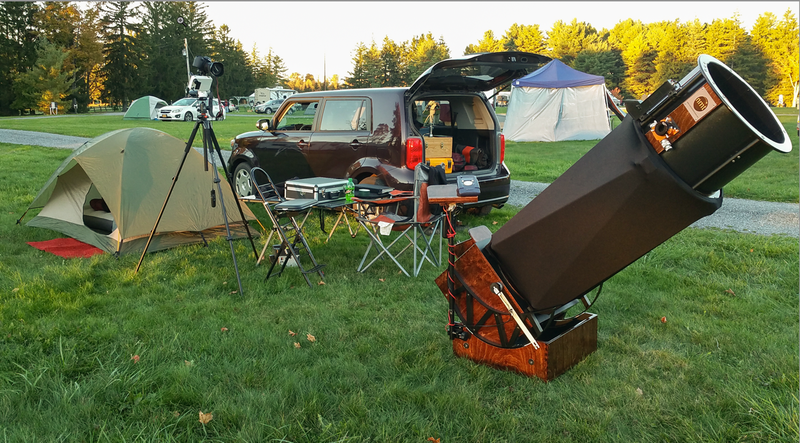 New Moon Telescopes innovative ideas are focused on making big Dobs easier to setup and use, and this has awakened a degree of excitement in observing that I didn’t expect. Aesthetically, this is the most beautiful scope I could ever imagine owning. Ryan Goodson’s attention to detail, carpentry skills and quality work creates beautiful instruments that become a part of the person who ordered it. 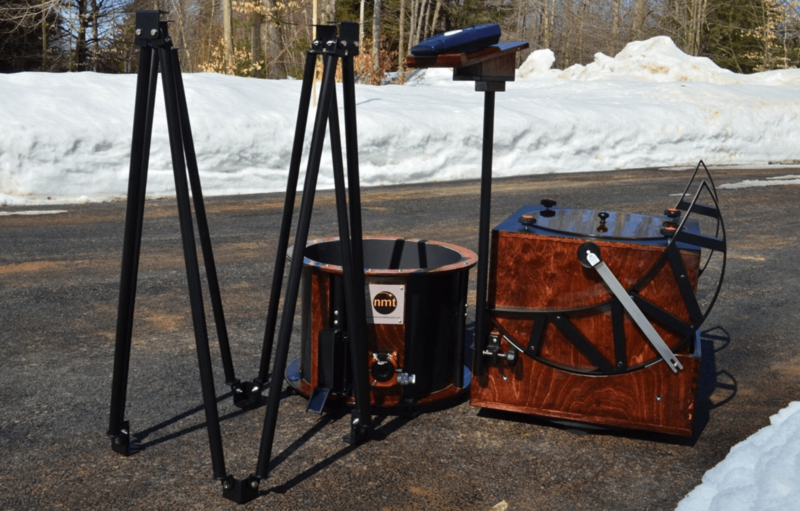 This entry was posted in Equipment and tagged Gear Review, New Moon Telescopes, Telescope. Bookmark the permalink.